Studio Ghibli founder Hayao Miyazaki has taken a few curtain calls in the past; if his final film is to be The Wind Rises, then he’ll be going out at the very top of his game. A beautifully animated study of Japanese aircraft designer Jiro Horikoshi, The Wind Rises is an engaging, deeply moving and mature film that exudes intelligence and compassion. 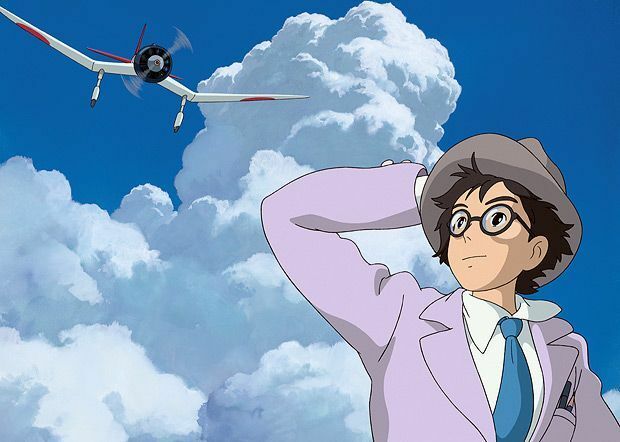 Re-voiced by an American cast, Miyazaki’s film is a fictionalized account of Horikoshi’s life, establishing Jiro (Joseph Gordon-Levitt) as a dreamer whose ideas soon take flight. Studying engineering, Jiro meets Nahoko (Emily Blunt) during the Great Kanto Earthquake of 1923 and falls in love, but her family close ranks to hide her tuberculosis from him. As World War Two emerges on the horizon, Jiro finds his ideas are much sought after, and returns to woo Nahoko with renewed confidence. But the uses to which those designs will be put appall Jiro, and he struggles with his conscience as his career prospers. Few directors would dare to put the dilemmas inherent in military aircraft design to the fore, but Miyazaki’s film deals sensitively with the notion that good work may be used for bad ends. The counterpointing romance with Nahoko is handled with similar grace rather than sentimentality, but the resolution will still elicit copious tears. Flight has been a key element of the Studio Ghibli films, from Kiki’s Delivery Service to Howl’s Moving Castle, but The Wind Rises has a unique warmth that makes it accessible for both children and adults. A scene with a German spy, voiced by Werner Herzog, nails the complexities of Jiro’s life: his ideas may come to fruition, but his destination is uncertain. Reality may be subject to change, but the beauty of the dream endures all earthly setbacks. General release from Fri 9 May.